Is Volkswagen your target? We don't want to be the world's largest manufacturer, but rather an especially likeable, desired and creative brand. Werner Frey, Hyundai's Germany boss, says Europe's biggest market will continue to be the Korean brand's regional "growth engine." 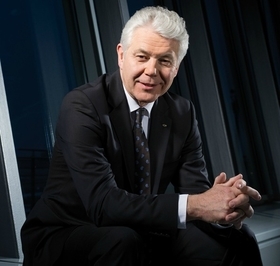 Frey started his career with Opel in 1976 and was Hyundai Europe's head of sales and marketing from 2002 until 2005 when he joined Fiat. He returned to Hyundai as its Germany head in 2007. Frey talked about Hyundai's ambitions with Automotive News Europe Editor-in-Chief Harald Hamprecht. Last year Germany accounted for about 75,000 of Hyundai's 358,000 sales, making it the brand's No. 1 European market. Why is that? The key reasons for our success in Germany are our committed dealer network, the expansion of our warranty pledge to five years for all new models, including maintenance, and the largest model offensive in the German market in our young history. This fall, we will celebrate our 20th anniversary. We are Hyundai's engine in Europe, and we want to stay that way. Hyundai Europe COO Allan Rushforth would gladly see sales of 100,000 units in Germany as early as 2012. Can you achieve this? That is certainly very ambitious. My goal is to grow constantly and achieve 100,000 units by 2015. In a total market of 3.1 to 3.2 million new registrations, that would correspond to a market share of about 3.2 percent. In 2008, we were still at 1.7 percent. I assume that Germany is still Hyundai strongest organization in Europe. This year, we will contribute about 80,000 of the 400,000 units that are planned, and about one-fifth of the 500,000 planned for Europe by 2015. What are your plans for this year in detail? Which other brands are you winning sales from? Even from Mercedes with models like the ix35. And our dealers are benefiting from this. Our average profit margin is 2.5 percent. During the year of the scrapping bonus, it was even 3 percent. That's why, unlike the competition, we didn't lose a single dealer. This also has to do with the fact that we maintain a very solid partnering relationship with our dealers and determine standards in close coordination with them and with the necessary advance work. How are your sales divided up among the various model lines? In 2010, our i30 was our most successful model with more than 30,000 units, followed by our smallest car, the i10 with about 16,700 units and the ix35 compact SUV, which was introduced in March 2010, with about 10,700 vehicles sold. Where do your incoming orders currently stand? In Germany alone, we have 3,000 customer orders for the ix35 in our order book, and a waiting period of about nine months due to the great demand, especially for the diesel. The change in the production of the ix35 from the Kia factory in Zilina to the Hyundai plant in Nosovice should help us to quickly work our orders down. That means it's not just appearance that separates Hyundai and Kia, but also production? Yes, in Europe at least. After the completion of the transfer, we will have a purely Hyundai factory in Nosovice and a purely Kia factory in Zilina. How would you characterize your relationship to Kia? Kia is a competitor in Germany. Why has Hyundai been much more successful than Kia? I would see our longer history as the reason, and certainly our car dealers. In Germany, we follow the clear philosophy of a close and profitable partnership with our dealers. In no other organization so far have I had as close a relationship to my dealers. What are the Hyundai group's criteria for success? We are a young, ambitious and fast-learning company that has remained down to earth despite all the success. Where other brands that are up to 100-years-old are considering how to close factories, our challenge is to utilize our brand-new factories at the highest possible level and build high-quality vehicles oriented to individual market demands. In two years, we are doing what the Japanese needed 10 years to accomplish. Is Volkswagen your new target? We don't want to be the world's largest manufacturer, but rather an especially likeable, desired and creative brand. Sales grow as a consequence of these objectives. In Germany, you have left major, established players such as Peugeot, Toyota and Fiat behind and are already the third largest importer. Where do you go from here? My goal is still to reach 100,000 units by 2015 aided by new models in segments that we have not occupied extensively or at all. Today we have 11 model lines. By 2015 it will be 16, including a model in the luxury class. That's correct, and a few units of the Equus as well, which is positioned above it. In addition, in the next few years, we will have the replacement for the i30, a new SUV and a hybrid vehicle in the pipeline. Your product plans are very ambitious. Yes, but we are just now launching a new era at Hyundai. Previously, we always oriented ourselves to the big players. Now we are slowly approaching the time when we want to show that we are setting trends ourselves. European automakers complain that the new EU-South Korea free trade deal will allow Korean cars to reach Europe more cheaply. I would look at this calmly. In Germany, just 10 percent of our models come from Korea. Our bestsellers, the i30 and the ix35, come off the line in the Czech Republic, for example. What is your greatest challenge currently? Right now, the greatest challenge and opportunity is certainly to manage the demand for the ix35 so that we gain new customers despite fairly long delivery times. But that problem will soon be solved, as I already indicated. In our Nosovice factory in the Czech Republic, we have a capacity of up to 300,000 units for three model lines. Will you expand your Czech plant? If demand were to continue to increase sustainably, I could easily imagine that we could further expand our capacity in the Czech Republic even before 2015. We have enough room there. A second factory can be built quickly. China is the best example. Why is China a good example? We are just now building our third factory in China; then we will have the capacity for a million vehicles a year there. At more than 700,000 sold vehicles, China is our strongest market outside of Korea and still offers Hyundai a great deal of potential.